The past few weeks have been full of surprises: weather and big decisions. You know Newton’s theory “for every action there is an equal and opposite reaction” applies to agriculture too. This wheat crop has seen lots of different stages. From a slow start due to drought, through the winter months and some late winter rains, then warmer weather brought the wheat out of dormancy and it started looking exceptional. But then come the lemons, or better yet, the freezes and harsh conditions. When wheat advances to the boot stage (the stage before the seed heads fill with grain), it is a critical part of the maturing of the plant. At this stage, wheat can only stand freezing temperatures of 28°F for up to 2 hours without having at least partial damage to the wheat. Hobart, OK, saw temperatures drop to 27°F twice in the two weeks. And better yet we saw 16°F in late March. It wasn’t in the boot yet, but still the crop was advanced enough to sustain damage from the cold weather. Although the more recent temperature drops have been preceded by moisture pushing the warm air from the ground, hopefully giving a little protection. In addition, the temperature is taken at 5 feet above the soil level. When you consider that information, and the possibility of warm air from the ground, we were perhaps spared a lot of damage from that area of insulation. Time will tell whether we received a significant damage or only partial. Also, with the added moisture, it makes rust (a disease in wheat) a much bigger factor when considering a million-dollar crop. Do we need to spray to fight against the disease or has the freeze already committed all the damage for us? Those answers will be answered in God’s timing. In fact, the Daily Oklahoman came out and wanted to do an article about the wheat freeze. It came out on Sunday the 21 in the business section. As I cut open the stem of the wheat plant to find the head, I was amazingly surprised at the length of head that is there. We are looking at a good crop if the good Lord is willing. Science will never be able to explain the mercies of His grace. In the midst of all these decisions, Oklahoma Farm Bureau Young Farmers and Ranchers hosted its annual conference in Yukon, OK, April 4-7. We visited Producers Cooperative Oil Mill. They process canola and cottonseed oil. We learned about the entire process from seed to oil. Among many interesting facts, we learned that when orange juice companies want to add pulp to their juice, they use the fibers processed from the cotton seed to “bulk” it up. We also were privileged to visit Express Ranches’ cattle operation and their Clydesdale barn. What an operation! We finished our tours at Devon Tower. The building is such a piece of artwork! The views are breathtaking! Look for YF&R at the state FFA convention and the OFB Legal Foundation’s Golf Tournament on May 3. On this Earth Day, celebrate ways we can be good stewards of what the Creator has given us. Every farmer and rancher around the world were the very first environmentalists because by protecting the environment it sustains our way of life. Living off the land and what He gives us is the best way of life for our family. It has been a great week; busy but great. The fun highlight was the Young Farmers and Ranchers State Conference. We have really enjoyed connecting with farmers and ranchers from across the state, discussing the different aspects of agriculture. This year, the state conference was in Broken Bow, Oklahoma, and as a standing joke it is NOT the armpit of Oklahoma! It is way in the corner and it feels closer to Arkansas and Texas than Oklahoma. It was a long drive but completely worth it. Friday we spent the day learning about chickens. I must be honest I was not overly excited about all the trees and the fact I couldn’t see even 1/8 mile ahead, but I admit that both forestry and chicken farming have a place in Oklahoma agriculture. Did you know that in Oklahoma alone forestry has 3 million acres! Yes that is MILLION! It is the third largest Oklahoma agriculture commodity and no, they do not count the mesquite trees in my pasture because I asked. However, my close friend Brent Howard has some bodark trees his grandfather planted that intrigued the OSU Forestry guys! The Tyson hatchery in Broken Bow handles more eggs than I have seen in my lifetime in just one day and maybe an hour. So many little chicks-holy cow there was a bunch. The Tyson processing plant was extremely interesting as we toured their entire process. It’s amazing how many employees they have at this facility. I believe they told us it was 1,600. The plant operates on 3 shifts and one cleaning crew, as compared to the hatchery that only operates on 17 employees and 2 maintenance members. They get their eggs from local farms within a 2-hour drive, hatch them and send the chicks back out to local farmers to feed for roughly 7 weeks before they are sent to the processing plant. They process about 260,000 birds a day and use 7 gallons of water per chicken. What astounded me the most is how many cuts of meat are used and that the most valuable part of the chicken, I assumed was the breast, was actually the cartilage in the back and the entire foot of the chicken. The foot is considered a delicacy overseas and the cartilage is used in the human medical field. Not to jump, around but back to the hatchery they vaccinate them 3 times once in the egg and twice before being shipped to a farmer. Justin, our tour guide, said that if they didn’t vaccinate in the egg most wouldn’t survive because of I believe a lung disease in the embryo. Meanwhile back at the ranch, obviously in all the storms, we received some more rain. After last year, you won’t hear me complain about it. The US drought monitor updated on April 10 states that we are nearly out of the drought. I would have guessed it would have taken several years of average rain to regain this moisture. God is so good. In addition, to reestablishing our moisture in the soil; God has also protected our area from some severe weather. I know this past week lots of our friends and neighbors weren’t so lucky. All the large hail that went through Kansas and Oklahoma certainly ruined lots of fields of wheat with lots of structural damages too. I started laying down the hay today hoping for a few days without rain so that I can get it safely in the barn. The wheat that had been laid down due to wind is mostly all standing up again. Grandpa and I took a tour around our places on Monday morning and I would guess 10-20% of our wheat was laid over and today only 5-10%. I am very pleased with that. 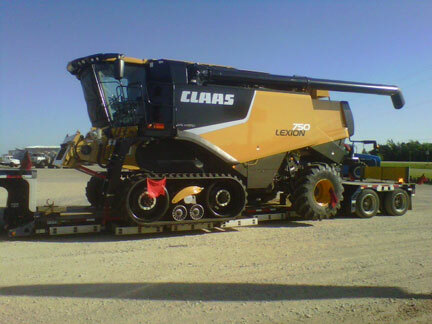 One of our combines is ready to go for the upcoming harvest. We received a photo message today that one combine is complete and sitting in Enid, Oklahoma. I am getting excited. All of the wheat is mostly filled and should start “turning” by the end of next week. Turning is a term used to describe wheat as it begins to die after, becoming fully mature and turning a golden yellow color.